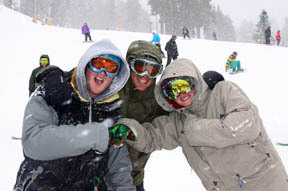 Wrightwood, CA – November 8, 2011: Mountain High is now open for the 2011/12 season and on Friday, November 11th, the Wrightwood resort will offer free skiing to all military, active and veteran, in honor of Veterans Day. This is the second year Mountain High has made this gesture. On Friday, November 11th, all military personnel with proper ID, active or veteran, will receive a free day ticket to Mountain High valued at $45.00. Tickets may be redeemed at any ticket window, limit one ticket per serviceman. Mountain High is currently open with the most terrain of any resort in Southern California. Operating hours are 8:30am to 4:00pm daily and the resort offers a full line of services from rentals to retail to repair. Visiting guests are advised to dress warmly as another winter storm is approaching that could bring between 5 to 9 inches of new snow. Currently all roads are open and clear however resort operators always recommend at least carrying chains when traveling in the winter mountains.